A. On your iPhone or Android phone, open your web browser and go to the following link: rmd.at/amaak. Follow the instructions to sign up for Remind. You’ll be prompted to download the mobile app. Text the message @amaak to the number 81010. If you’re having trouble with 81010, try texting @amaak to (678)929-1192. Don’t have a mobile phone? Go to rmd.at/amaakon a desktop computer to sign up for email notifications. Lake Orion's Latest Belt Promotions! 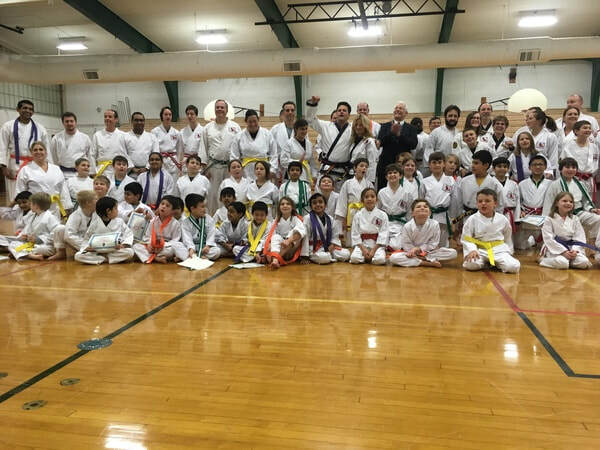 An overview of American Martial Arts Academy for Orion Neighborhood Television. New Team World Record set by Michael Mannino of Lake Orion, MI, USA, and Seth Britton of IN, USA, in Lake Orion, MI, USA, in conjunction with Americal Martial Arts Academy. 114 one inch boards broken by a 2 person team with double hand strikes in 10 seconds. Welcome to American Martial Arts Academy! AMAA was founded in 1989 by Grand Master Leo Mayer, 8th Dan. Our certified Black Belt Instructors teach the Moo Duk Kwan (Soo Bahk Do) Tang Soo Do style of Korean Karate. Our Schools are located in Michigan in Lake Orion and Clarkston and in Englewood, Ohio. Our classes focus on self-defense, self-discipline and self-control. AMAA is a family oriented organization and we invite the whole family to join us. We have many instructors and students that learn alongside their children. Our program is a great bonding experience and a healthy activity to do together. Martial Arts is not only a physical art but also a mental art, with many rewarding benefits. Our Instructors help with every stage of training. Please let us know if you have any questions during your training. If you have any questions, concerns, or comments relating to the style, our school, your training, or anything else, please feel free to contact us at (313) 407-0012 or by email at KarateAMAA@gmail.com. We appreciate your input and thank you for training with us.